Past Projects: Most of these projects were videos produced under the Omniscopic Productions umbrella. They range from non-profit promos, science video news releases (VNRs), pilots, to broadcast TV shows. If there is viewable content, the thumbnail will link to it. "Video is a poor excuse. I know." Secrets of the Coral Reef Episode #336: I join marine biologists in the Caribbean where scientists believe climate change threatens the reef ecosystem, depleting fish schools and spawning an increase in parasites. 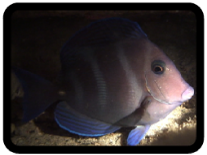 Understanding how parasites, fish and the cleaning stations are all interconnected provides researchers new insight into the reef's complex habitat. Research Expeditions wanted to highlight their unique personal approach to providing rugged African safaris. This promotional web-video follows a group of adventurers as they cross the African plains and then climb the continent's highest peak, Mt Kilimanjaro. Segment two of the the "Science Out There" Demo. In this episode, I hike out to the remote wilderness of Northern Idaho where abandoned mines may be the last habitat refuge for several species of bats. Bat biologist Rick Sherwin and his team search for bats in these extremely dangerous mines before the Forest Service blasts them shut forever. Using magnetic resonance imaging (MRI) , a neuroscientist at the Beth Israel Deaconess Medical center in Boston, has discovered visible differences between the male and female brain. This web-video VNR highlights research into a subject of a potentially controversial nature. A Maine based outfitter wanted a mini-doc that showcased one of their adventures. This web-video follows a diverse group as they explore the islands and includes the personalities from behind the scenes. Scientists at The Massachusetts Institute of Technology are using sub-microscopic processes to develop new synthetic materials. As a leader in this new field of nanotechnology they need to promote their work to the world. In the past they would use a written press release. But today they use the video news release (VNR). Segment three of the the "Science Out There" Demo. In this episode, I make my way out to the Isles of Shoals where field biologist Julie Ellis is working to understand the complex ecology of gulls. It turns out that thier lives are more closley connected to ours than we think. The Shoals Marine Lab wanted a news-style promotional web-video to help recruit undergraduate students to their summer field research program. This video profiles one graduate student and highlights her field research project working to better understand Gulls and their ecology. A short pilot exploring the wilds of Costa Rica. This film surveyed the flora and fauna of three biological field stations (La Selva, Monte Verde, and Las Cruces) located in three different ecosystems. This promotional video presents the vision and mission of an organization dedicated to science, reason, and the responsible use of technology. 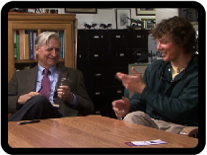 The video includes appearances of science and society scholars and authors such as: E.O. Wilson, Richard Dawkins, Daniel Dennett, Steven Pinker, Ann Druyan, and Lawrence Krauss. This video provides a glimpse of a new high-energy science program for PBS. This project was funded in part by the National Science Foundation. The piece is designed to demonstrate an innovative approach to presenting science content to a young adult audience. This short piece provides a visual glimpse of what I have set out to accomplish with video. I wrote, directed, shot, and editied this movie with the exception of the "fly through space" sequence, which was borrowed from the movie "Contact." Scientists at Harvard Medical School are working to understand and fight cancer. They need to disseminate their results to the scientific community as well as the general public. This VNR profiles a team of physicians who are developing a new way to “see” cancer within living cells. Using special quantum dots they make molecules glow a visible green to new cameras. This newer reel shows me interacting with people and participating in various field-research activities. This piece is designed to present a little more mature version but retain an authentic personal view. Saving Grevy's Zebra Episode #305: The recent demise of the rare Grevy's zebra in northern Kenya has researchers baffled. 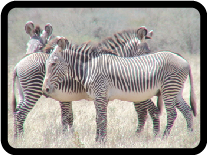 Grevy's zebras seem to be more at risk of lion predation than plains zebras. Now, conservationists are seeking reasons why. 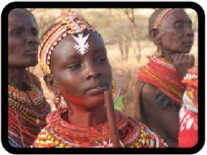 Travel to Northern Kenya to understand how Indigenous Tribes can help. High in a remote Utah canyon, a 1000 year-old Indian community once thrived. This ancient settlement was unknown by all except the reclusive rancher who kept his secret for the past half-century. For the "Living In The Sky" segment, I was hired to film a team of archaeologists as they surveyed a high knife-edge site. The Lake Champlain Maritime Museum was building a full-size replica of a working schooner and wanted to involve school groups in its construction. They also needed a multimedia museum exhibit to document the process. This exhibit video looped as part of a museum installment alongside the mast tabernacle built by the students. Massachusetts Institute of Technology needed a video news release to highlight the work of one of their leading researchers. This VNR web-video profiles a scientist that uses the natural nano-scale processes used by the Abalone to create super a strong shell from Calcium Carbonate. Scientists can recreate this process in a lab to manufacture useful synthetic materials. This web-video news release examines the subject of how exposure to the sun affects our health. Overexposure to ultraviolet radiation has long been understood to cause serious skin diseases, but it also provides us with many beneficial biochemical results as well. This little promotional video documents the adventures and stories of a small wooden surfboard shop up in Maine. The piece is now airing repeatedly on Al Gore's cable TV network. The series is currently in development and has signed a production deal. The Burlington Community Schools Project needed a web-video that they could use to showcase their programs to potential funders. This development piece serves as an appeal from their executive director and shows the work they do and the kids they reach. One of the most dramatic aspects in the life history of the Olive Ridley Sea Turtle are the great nesting aggregations known as Arribadas. During an arribada thousands of gravid females come ashore and dig shallow nests in which to lay their eggs. This video follows a single female Olive Ridley sea turtle as she carries out this ancient ritual on a remote Costa Rican beach. Segment one of the the "Science Out There" Demo. In this episode I travel to the deserts of New Mexico to find out how the Anasazi people may have reached some of thier most innaccesible cliff- dwellings. I meet an expert in ancient technology who thinks they used handmade yucca ropes. To test his theory, we harvest some yucca, make a rope, and then it's up to me to try it out.